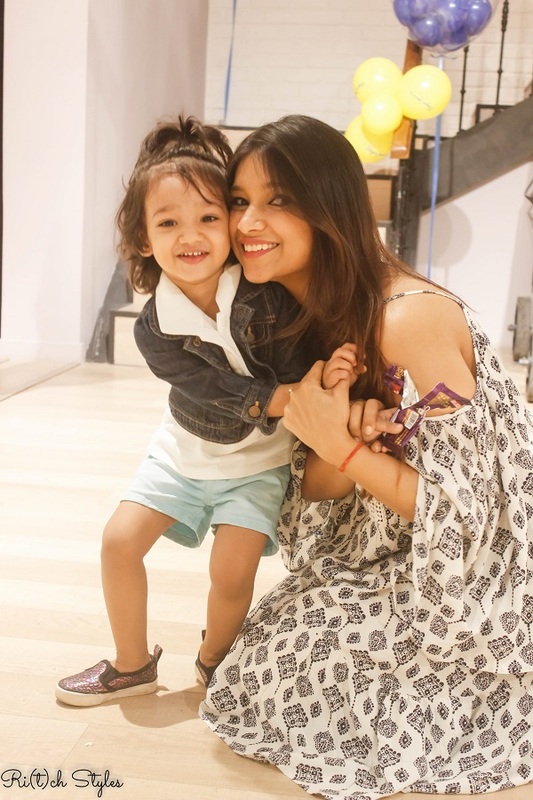 Ri(t)ch Styles : Indian Fashion, Beauty, Lifestyle and Mommyhood Blog: A Fun Saturday Evening at the #PepeJeansKidsCarnival! 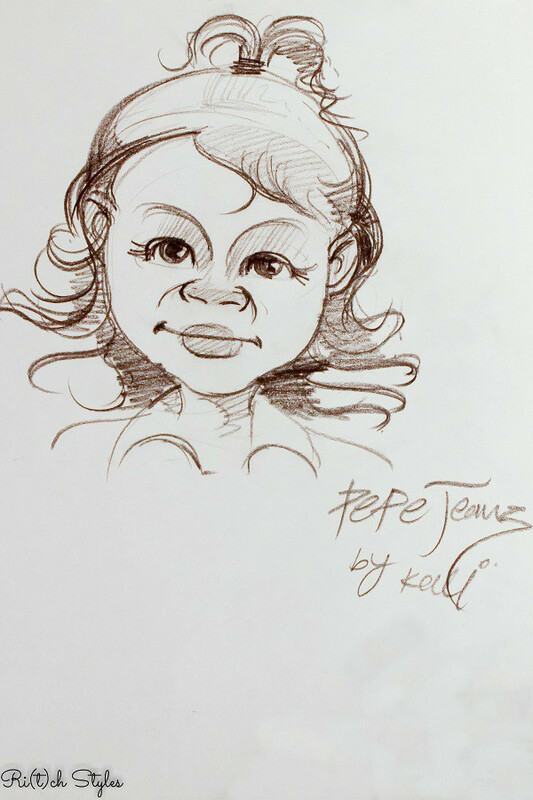 A Fun Saturday Evening at the #PepeJeansKidsCarnival! 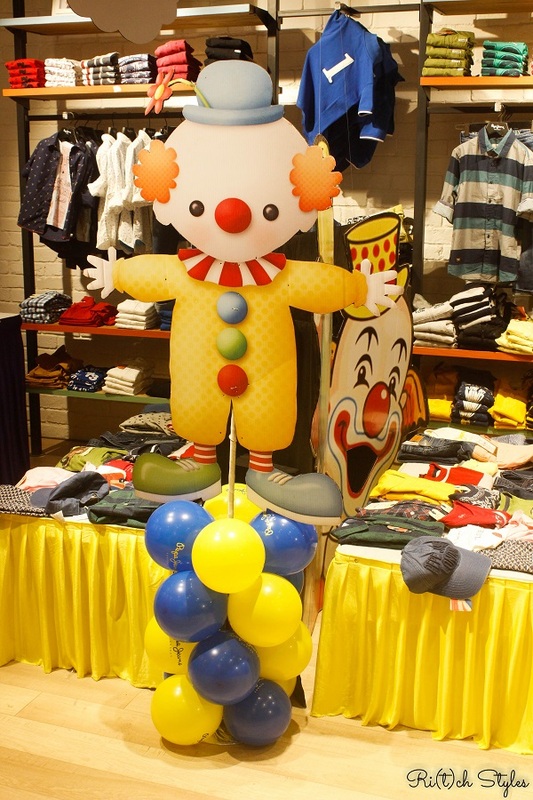 Carnivals bring out the child in everyone, and when one of the best fashion brands in the country decides to organize one for the little ones, you know you and your kiddo are in for a good time! 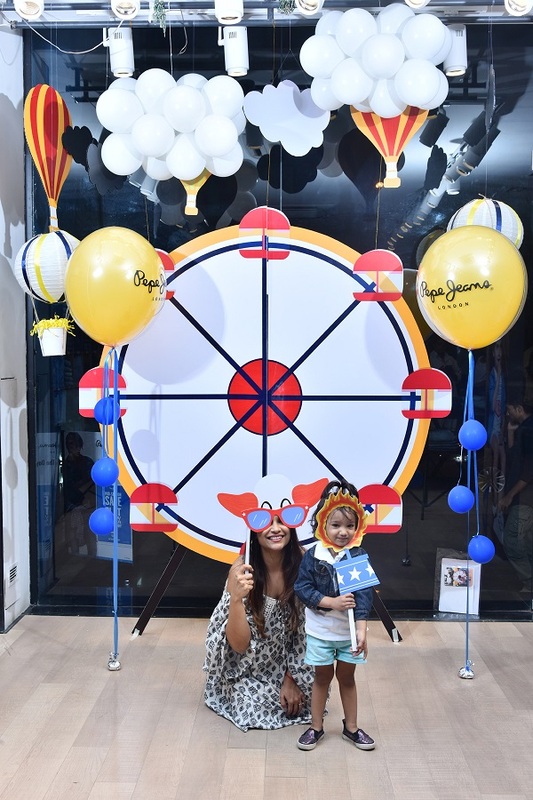 With my crazy schedules, I always look for reasons to get to spend more quality time with Aryaa, and when Pepe Jeans invited me and Aryaa for The Pepe Jeans Kids Carnival, I knew I couldn't have asked for anything better on a Saturday evening. 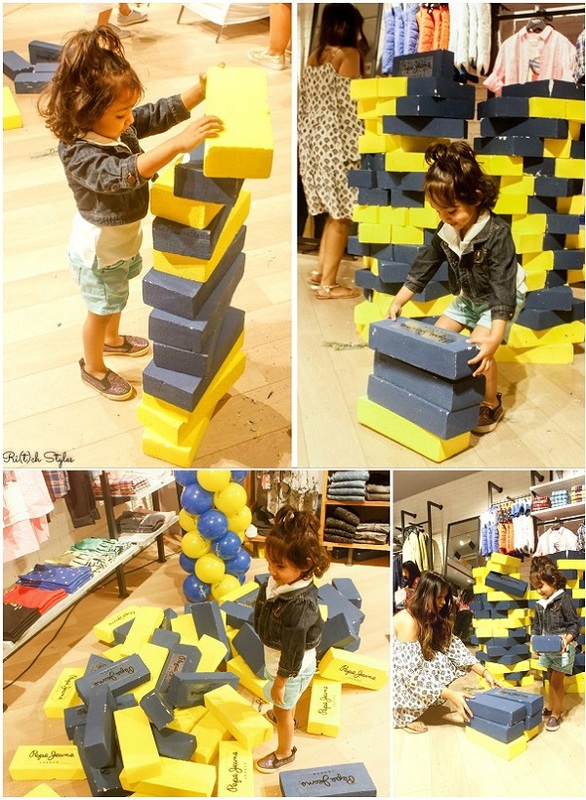 The Pepe Jeans Kids Carnival was hosted at the brand's flagship store at Linking Road, Santacruz(W). 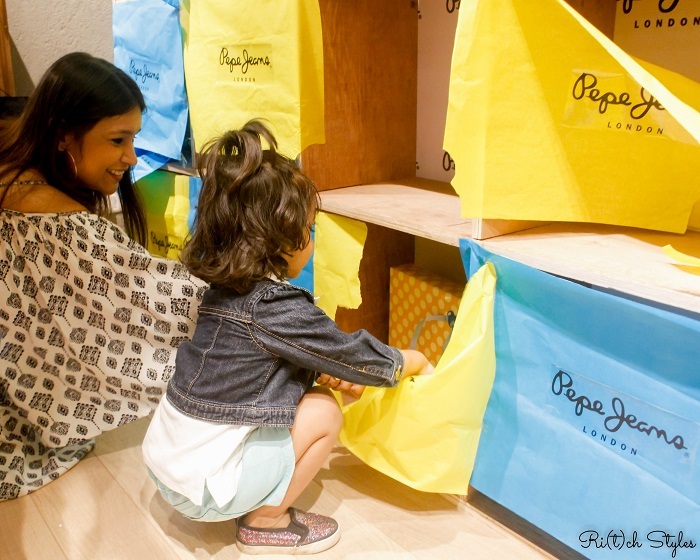 The main objective of Pepe Jeans to organize this carnival was to get kids to have a ball of a time, and get mommies to spend quality fun time with their kids and get a chance to check out the latest Autumn Winter collection. I could feel the buzz in the air the minute I entered the store as the turnout was amazing. The store was beautifully decorated in bright colours with installations all over the place and you could hear the foot tapping music being drowned by the noise the excited kids were making. Aryaa took no time to head to the lower floor where the fun, food and frolic had been set up. The carnival had the kids playing life-size Jenga, getting their caricatures done, dancing, playing games (some with mommies too) with an emcee anchoring who gave the winners cool goodies from the brand. There also was a mystery cubical wall covered with blue and yellow paper, which the kids had to punch and take the surprise gift kept in the square that they punched at. Aryaa was the lucky one who walked away with the biggest gift in the mystery wall and the happiness on her face was priceless! The Jenga activities were really enjoyable and though Aryaa was too small for the group activities, she just didn't want to let go of the Jenga blocks. 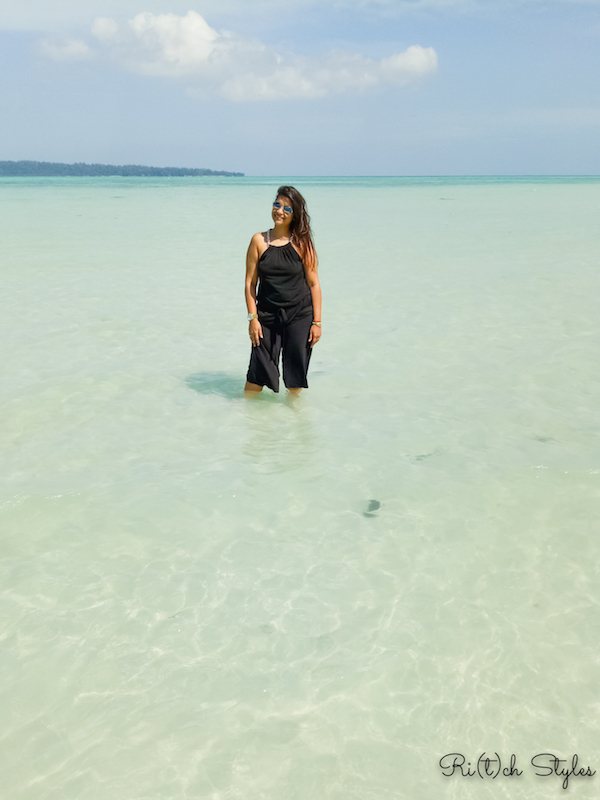 She took over the whole space on her own after a while and enjoyed it to the fullest. I too indulged in some Jenga time with her and it was so nice to see her use her physical and mental skills so intelligently to create different kinds of structures. The best part was that she enjoyed knocking down the structures too and didn't make a big deal even when the bricks fell on their own. The finger food was a lovely assortment of smilies, fruit kebabs(which Aryaa loves), sandwiches, herbed baby potatoes, cookies, chocolates and much more which kept the kids' tummies happy. Abundant supply of lime water, juices and water kept their sugar levels high as they indulged in 3 hrs of pure entertainment. Caricatures are becoming a collectors item in our house and Aryaa was really cooperative with the guy who drew hers. The end result was a really cute caricature that is going to get framed very soon! Thank you Pepe Jeans India for the great evening and the cute goodie bag that made Aryaa so happy! Aryaa and me are already looking forward to another entertaining #PepeJeansKidsCarnival soon! A Great Post !!! Lovely photos !! !